Walk through the Roman, Mediaeval, Renaissance and Baroque heart of the Eternal City. Possibly the greatest repository of art and history on the planet. Enjoy Matthew Kneale's ideas, exerience and personal angles. Walkopedia thanks famous novelist Matthew Kneale, who lives in Rome,for letting us share the ideas he gives his friends who are visiting the city. For more information on Matthew and his books - including the 2000 Whitbread winning 'English Passengers' - see his page in ContemporaryAuthors.com. Welcome to Rome. Rome is without doubt among the most extraordinary and fascinating cities, but it's not always an easy place to visit. I've put together this short tour to try and point people in the right direction, and in particular to steer them away from the main roads, which can be noisy and tiring. Rome may be famous for its ancientness but it may be helpful to remember that most of what you are looking at is a Renaissance and Baroque city. Churches are mostly baroque, while the far older ones have usually suffered Baroque remaking of their interiors. This was no accident. After some lean years during the times of the Avignon antipopes, when hardly a church was built, the city went through a prolonged and extensive overhaul, much of which was deliberately to make it into a showpiece of the Catholic world to help combat the rise of Protestantism. The manic church building was in many ways a kind of religious equivalent of the Moscow underground. Some of the churches were built at huge expense (some paid for with Aztec and Inca gold) while others were done more hurriedly and cheaply, with fake marble columns and flimsy decoration that give them a distinctively theatrical feeling. As to this tour, if you start early, walk fast and dont take any of its detours, it might just be possible to do this in one day. Two days would be more realistic, and much more relaxing. Georgina Masson: Rome (Companion Guides) is the definitive account of everything there is to see in the city. Beautifully written, never dull and very thorough. It was published in 1965 but has a timeless quality. Besides, not that much has changed. The Time Out Guide to Rome makes an excellent up to date accompaniment, very accurate on restaurants, cafes, shops and hotels and everything hip. The Oxford Archaeological Guide to Rome gives a complete and surprisingly readable account of all classical era sites. Start at the Spanish Steps. You can take the metro there (line A, Spagna). Walk up the steps and enjoy the view. Also if you feel in a literary mood you could in drop in on the Keats and Shelley Museum just by the Spanish Steps: it's just a couple of rooms, where Keats lived for a short time before he died, but atmospheric. If you want fashion, this is the area, especially around via Condotti. Good not too expensive restaurant nearby: Flaschetteria Beltramme, Via delle Croce 39, old fashioned and popular with international celebrities. Turn up before 1pm as its always popular and you cant book: they have no phone and dont take credit cards. From here walk south to via Propaganda, named after the Palace of the congregation of Propanda Fide: a centre of the counter-reformation, now containing numerous fashion clothes shops. The east facade was designed by Bernini, the west by Borromini, his great rival. Between the two of them they built most of Baroque Rome. Bernini, the showman, was easily the more successful at the time, but now Borromini has become quite a cult architect. Carry on down Nazareno then cross Via Del Tritone to Via della Panetteria no 42, for probably the most serious ice cream youll ever taste: Il Gelati Di San Crispino (closed Tuesdays). Take your ice cream and walk round the corner to eat it by the Trevi Fountain. Now go west and cross Via del Corso (Romes Oxford St / Bond St: good for clothes but not your wallet). Just on the other side, on the Piazza Colonna, is the Column of Marcus Aurelius. Continue south to Piazza di Pietra, with the huge columned facade of the Temple to Hadrian (behind it is Romes stock exchange). The next square down, Piazza S Ignazio, with its arrangement of side streets resembling a theatre stage, was the headquarters of the French revolutionary government of Rome in the 1790s, and has a distinctly Parisian feel. On the south side of the square is the huge Baroque church of S Ignazio, which has a splendidly preposterous treompe loeil of a dome in its flat ceiling (much cheaper than a real dome). Just further on is the church of Santa Maria Sopra Minerva, Romes only gothic style church, with some very fine Filippino Lippi frescoes in the Carafa chapel. Just in front of the church is Berninis memorable elephant. Now weve finally reached the Piazza della Rotunda and the Pantheon. If you see nothing else in Rome see this, easily one of the greatest buildings in the world. Things you may want to know The whole thing, including its bronze doors is almost 19 centuries old. Its dome is large than that of St Peters and was the largest dome of its kind in the world until the 20th century. The hole in the dome is 30 feet across. The front portico should have been ten feet higher but something went wrong with the columns (you can see the height it should have reached from the decoration along the side of the building). The building reflects a major change in religious architecture: for the first time the dramatic effect of the interior was seen as at least as important as the exterior. 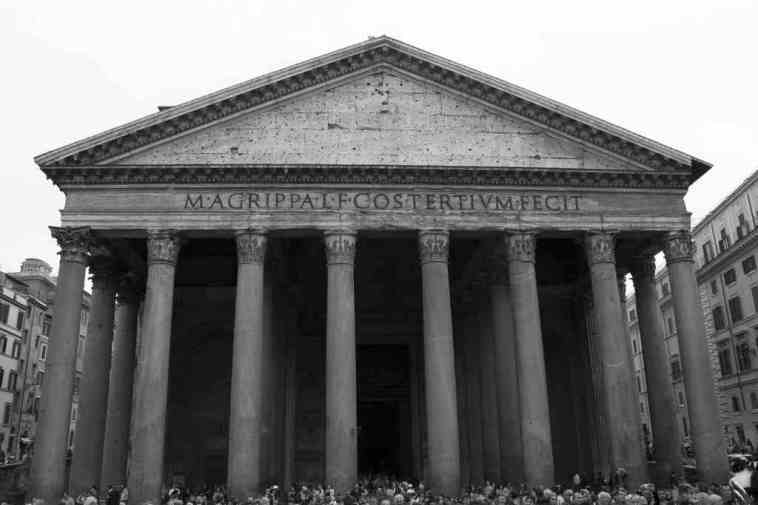 It also shows very clearly the change from Greek architectural style (the portico: all straight lines and columns) to the Roman (the rotunda: all curves and arches). Good restaurants nearby: Maccheroni, Piazza della Coppelle 44 tel 06 6830 7895. Myosotis: Vicolo della Vaccarella 3 / 5Tel 06 686 5554. From here carry on one block west to the Dogana Vecchia and cross this to reach the church of San Luigi dei Francesi (open 8.30 - 12.30 / 3.30 - 7pm) and go to the chapel at the end on the left to see 3 of Caravaggios best paintings. Continue 2 minutes further west to reach Piazza Navona, one time ancient Roman horseracing stadium, now elegant stadium-shaped square with some superb fountains, notably Berninis Four Rivers fountain. Also numerous cafes offering Romes most expensive coffee. From Piazza Navona go south a short distance and cross the busy Corso Vittorio Emanuele II to Piazza Teatro di Pompeo: this was the site of Pompeys huge theatre complex and you can see it still in the shape of the buildings. Caesar was assassinated at the other end of it, by what is now Largo Argentina. Just further on is the Campo dei Fiori: a beautiful medieval square with a wonderful flower / fruit and veg market in the mornings. On the square is a good wine bar, Vineria. Good value medium expensive restaurant nearby: Albistro: Via dei Banchi Vecchi 140A (tel 06 686 5274) run by a Swiss. From Campo dei Fiori go east along Via dei Giubbonari (good value clothes shops) and cross the Via Arenula to the old Ghetto area, which is a great area to wander. Via del Portico dOttavia has a wonderful mishmash of medieval buildings with ancient Roman carvings stuck into the walls for decoration. A street further north is the Piazza Mattei with the splendid Turtle Fountain. At the end of Via Portico is the Theatre of Marcellus: part ancient Roman theatre, part luxury flats. Good place to eat: Sora Margherita restaurant, Piazza delle Cinque Scole, 30, just south of Portico dOttavia (tel 06 687 4216). Simple, the menu short and informal, but this is an excellent and inexpensive place for Roman and Jewish-roman dishes. Its technically a club so youll have to fill in a short form to join. Open lunchtimes only, and eveningsonly on Friday and Saturday. From the Ghetto area turn north to Piazza Venezia, then cross (with care!) to the Capitoline Hill. If you have time the Capitoline Museum is well worth seeing, especially the courtyard with its random pieces of ancient imperial statues. Also it is now possible to climb, without charge, the Vittorio Emmanuele monument (the huge white Edwardian eyesore popularly known as the Wedding Cake) though youll have to go down from the Piazza Campidoglio and climb up again from the Piazza Venezia side. A little grotesque though the building is, it has some fine views. From the Capitoline you can stroll down into the Forum. Dont miss the Senate House. The forum itself can be a little puzzling at first sight, as there is not very much left. A good deal of what had survived was broken down and reused in great church building campaigns from the fifteenth to seventeenth centuries. The original, famous forum is surprisingly small, and confusing from stages of rebuilding. It is almost triangular in shape. Think of it as a Piazza. Its role was much the same: a busy meeting point, surrounded by all the buildings that mattered in a city: administrative, religious, and financial. The Palatine Hill above the Forum is also well worth seeing though, like the Forum itself, it has suffered from at least a thousand years exploitation as a stone quarry, and it can be confusing. Built largely by Domitian, the Imperial Palace was a much an administrative centre as a place of domesticity. It was the earlier emperors who used this most. Many of the later ones never reached Rome, as they were too busy fighting barbarians on the frontiers. Back to the main part of the Forum, continue to walk up the hill through the forum area, to the Arch of Titus (commemorating his victories over the rebellious Jews: depicted is the looting of Jewish religious artifacts during the destruction of the great Temple in Jerusalem), then descend to the inevitable Colosseum. As Rome grew more and more further forums were built, which are now largely lost beneath Mussolinis Via dei Fori Imperiali (built hurriedly and destructively for his drive through with Hitler) but one forum has survived largely intact and is well worth visiting if you have time for an hours detour. The Forum of Trajan is strikingly preserved, containing shopping arcades which would not seem out of place filled with trendy clothes shops and takeaway pizza joints. Trajans Forum is clearly visible on the other side of the busy Foro Imperiali youll see its distinctive semi-circle of masonry rising up a little hill but the entrance is at the back, on via Nazionale. Entrance is free except for the small exhibition area. A real must, just beyond the Colosseum, is the church of San Clemente on Via S Giovanni in Laterano. This is a beautiful medieval church in its own right, dating from the twelfth century (after its predecessor was destroyed by passing Normans) and has wonderful mosaics. What draws people, though, is the archeological excavations beneath. First the remains of the earlier church, then beneath that remains of a classical era house, an ancient alleyway, and across that, a Mithraem. An underground river adds to the atmosphere. Nowhere else in Rome gives the same flavour of the layers of history. Opening hours: Mon - Sat 9.30 - 12.30 & 3 - 6pm. Sunday: 10am - noon & 3 - 6pm. You really need a full day to do this area justice. St Peters is an essential thing to see, but there is something about its proportions that make it hard to realize just how huge it is. It helps if you look up to the letters below the inside of the dome, and remind yourself that each one is 6 foot high. Try not to miss climbing up the dome (unless you suffer from vertigo). The Vatican Museum is the Louvre of Rome, a wonder which some would say surpasses anything else in Rome. But if you dont have much time you may question if you want to go. In high season the queues can be as astonishing as the Sistine Chapel. Do try and visit the Castel SantAngelo, originally Hadrians tomb and later the popes private fortress. Look out for the high wall that was built by the popes as an escape route from the Vatican to the Castel SantAngelo in moments of crisis. It proved useful too, notably during the sack of Rome during the wars of Charles the fifth. Trastevere is a wonderful area of medieval streets in which to wander. Dont miss the beautiful church Santa Maria in Trastevere, one of the finest churches in Rome with spectacular early medieval mosaics. The areas reputation as centre of good eating is a little outdated, but with care you can still dine well. This is the most lived-in part of the old centre, Romes equivalent of the East End, now invaded by numerous foreigners. You can even see films in English at the Pasquino cinema on Piazza S Egidio. The best place for a cheap, decent meal is Augustos, Piazza de Renzi. No booking, get there at 8pm sharp to avoid a queue, earlier in summer if you want to eat outside in the evening. For something more sophisticated, and expensive (but very good) try the Antico Arco straight up the hill at Piazzale Aurelio 7. Tel 06 581 5724 leave your name and number and booking details on their answerphone and theyll ring back to confirm. Cross over the Viale Trastevere and meander through the streets of the other half of Trastevere (less picturesque but also less visited). Cross the river via the Tiber Island. Walking over the second, eastern bridge (Ponte Fabricio) you are walking over Romes oldest surviving bridge, that was already standing when Caesar was just starting his career. Carry on along busy via Petroselli past the little classical Roman temples of Fortuna Virile and the misnamed temple of Vesta to the church of Santa Maria in Cosmedin: a lovely church in its own right, with the famous Mouth of Truth in its forecourt (actually a drain cover) generally with a little queue of Japanese tourists taking each others pictures pretending to look frightened. If you really want a detour you can carry on to the old Circus Maximus (as seen in Ben Hur: now theres not much left besides a shape) and up to the Aventine Hill to the Parco Savello (great views over Rome) and to early medieval church of S. Saba. Just beyond is the famous Keyhole with its view of the city. From here you could venture even further to the Protestant Cemetery, full of famous faces, and cats: a quiet spot. And even on to Monte Testaccio (though you need permission to visit). This was once a dumping ground for amphora of olive oil landed at the nearby river port in classical times. As the centuries passed the pile of amohora built into a sizable mound - a Roman Silbury hill - which you can climb, ancient pottery crunching under foot. Its now a gentrifying working class area, the hill itself surrounded by car repair joints. There are lots of good restaurants in this area, excellent value and quality food in a no-nonsense setting, such as Augustorello, Via Giovanni Branca 100 tel 06 574 6585. Piazza Quirinale is home of Berlusconi and has some fine views of Romes skyline. From here head north-east along Via del Quirinale to see a pair of churches that epitomis the rivalry between architects Bernini and Borromini. San Andrea al Quirinale was Berninis effort, and is gold, oval, and suitably encrusted with excitable statury. A hundred yards further on, at the crossroads of the Quattro Fontane is Borrominis try, San Carlo alle Quattro Fontane, which is tall, white, cool and strangely atmospheric in its obsessive geometrical way. From here it is not far to Termini station. The Termini area is not especially likeable, and is an area where it is wise to watch for your wallet, but there are some good things here nonetheless. Just by Repubblica tube, is the excellent National Museum of Rome, especially good for the classical wall paintings on the top floor: youll need to book into a tour, but this can be done on the spot and usually at short notice. More of a detour to the south east on the Esquiline Hill is the early medieval church of Santa Prassede (via santa Prassede, open 7.30 noon and 4 6.30) which has some fine, very colourful, Byzantine style mosaics. Not far away is Santa Maria Maggiore, one of Romes big four pilgrimage churches, which has some fine medieval mosaics among the hideous baroque restoration. From here one possibility is to walk on to the Via Veneto which is one of Romes swankiest areas, with many of the citys most expensive hotels. If youre in a mood for a little Hammer Horror you could call in at the church of Limmacolata concezione, which has a crypt of chambers full of the monks skulls and bones, arranged into elaborate patterns by their living successors. At the top of the Via Veneto you pass through the cties 3rd century walls to reach central Romes largest park, the Villa Borghese, which contains both the zoo and Galleria Borghese, a tight little palace whose decor competes hard with the art exhibited there. Well worth seeing. Another possibility from Termini is to take a bus (36, 90) along the via Nomentana to the church of Santa Constanza (opening hours: Mon: 9am - noon only; Tues - Sat: 9am - noon and 4 - 6pm). This is the only sight Im listing that is outside the town centre, but its well worth the detour. Originally built as a tomb for Constantines daughter, this round building is one of the earliest churches in existence, and is filled with extraordinary mosaics which seem to capture the change from the classical era to the Christian: they are mostly pastoral, showing wine-treading, birds, jugs of wine etc. There are also some good catacombs here. If Santa Constanza is locked, try finding someone at the next door church of St Agnese. For Maps, Accommodation, Guidebooks and other Practical Information, please see our Romepage.